Just because we are used to scissors being able to do only one thing—cut, it doesn't mean we have to be stuck with scissors that can do only one thing. Smart Sizzors can do more than one thing, that's why they are called smart. But do you even want scissors that offer more? Even though Smart Sizzors uses a name that is spelled incorrectly, which is ironic considering the other half of its name, it looks like it offers some really handy features that might make it better suited for the shop rather than the kitchen. In addition to the scissor function, the Smart Sizzor is also packing a wire stripper, a nut cracker, and most importantly, a bottle opener. 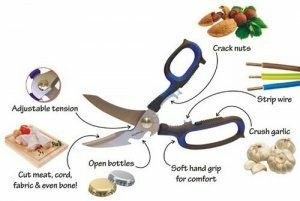 Regular scissors use straight blades; the Smart Sizzor, however, uses hardened-steel curved blades that are strong enough to cut through chicken bones.